A friend of mine has been telling me for years that I really need to check out books by Richard Mabry. I've looked a couple of times, and they sound appealing. Medical suspense is certainly a genre that appeals to me, particularly when it is written by an actual doctor. 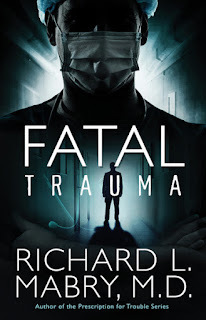 So when I had the chance to review Fatal Trauma, I simply had to go for it. She was right to rave about Mabry's books. I do not often find myself completely sucked in to a story within the first couple of pages anymore. This book? One paragraph of exposition, and the doctor we are just being introduced to is hearing a crazed gunman shout, "Nobody move!" That got me involved in the story. The plot twists and turns, and when you think maybe you've figured part of it out, you suddenly discover another strange piece of the puzzle that makes you second guess everything. Who can Mark and Kelly trust? What is true? I didn't put the book down. I couldn't. The medical aspects all sounded realistic, which I'd expect from a physician-turned-author. I'll be looking for more of Mabry's titles.